Choosing a venue is one of the most important aspects of your catering event, after the food! The venue should reflect the occasion for which you hired a caterer. At Woodman’s, we have catered at many of Boston’s finest venues. When choosing a venue for a wedding, a more formal atmosphere might be what you want. When looking for a venue for a more casual event outdoors, you might consider renting a tent. It could be in your backyard or at a private property/venue that allows outside seating under a tent. In addition to the incredible catering from Woodman’s, we are very fortunate to have excellent relationships with venues, which makes your event effortless for you, the host. Here’s a list of the some of the best venues throughout Massachusetts for your catering event! The charming and historic Benjamin Franklin Institute of Technology offers premier event facilities rental on the South End. Whether you’re getting married, holding a banquet, or catering a corporate event, this unique event venue is perfect for larger gatherings with over 8,000 square feet of space. 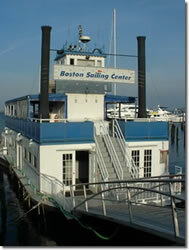 Boston Sailing Center boasts a permanently docked Riverboat at the Lewis Wharf in Boston. 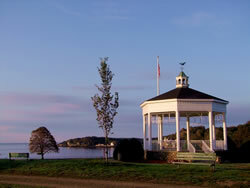 Its unique facilities are perfect for a true New England clambake and the view on the water is nothing short of incredible. Pre- and post-race cocktails or lunch can be held on the upper deck and can be as casual or as elegant as you like. The Bradley Palmer State Park is a 721-acre that has everything you could want in an event venue with stunning natural beauty, including rolling meadows, winding paths and carriage roads, and a show of bright rhododendrons in warmer weather. Bradley Palmer State Park offers facilities for picnicking, which can be a great place to host your catering event in the great outdoors. The Cambridge Boat Club boasts an exciting multi-functional space that features everything you need to host a catered event with style, including a kitchen, a bar, and two large event rooms. The unique boating décor featured throughout the historic facility gives the Club that North Shore feel, and don’t forget about the stunning veranda that overlooks the Charles River. For those who love the outdoors and desire a catering event venue away from it all, Camp Kiwanee is the perfect choice. 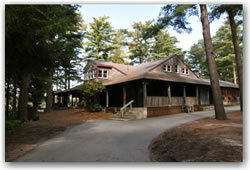 Deep in the center of Camp Kiwanee is the Needles Lodge. Having been built in 1908, the space is full of rich history and rustic themes. Whether you’re hosting a business luncheon with a casual clambake, or you’re looking for the wedding venue that is “just right,” Camp Kiwanee’s facilities have everything you need. Beverly, Massachusetts is home to the Carriage House at Lynch Park, a popular destination for catering events of all kinds. 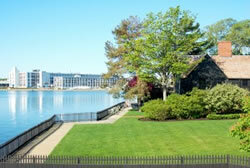 Lynch Park is 16 acres and the Carriage House sits directly on the waterfront with access to two separate beaches. The caterer’s service area at the Carriage House ensures that your caterers will be able to set up and cater your event smoothly and efficiently. Cedarland is a great place for corporate outings in the warmer weather and is available for gatherings of many sizes from the middle of May through the beginning of September. Not only is the space great for catering delicious fare, your guests will remember the fun they had with mini-golf, poolside relaxing, and the SkyWalk Ropes course. Community Boating Inc. of Boston has outdoor and indoor space available for events and is located directly on the Charles River for optimal views. Nothing is more satisfying after a sailing event than a barbecue or clambake, and Community Boating is well equipped to handle your corporate or personal event needs. 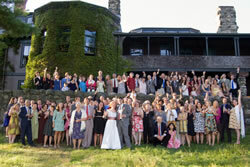 Community Rowing, Inc. boasts a generous wedding and special event venue. The Harry Parker Boathouse has a gorgeous, 150 degree view of the river and holds between 180-200 people depending on what type of event you’re having. With two balconies and a 3,040 square foot rental area, the Harry Parker Boathouse is the perfect venue for your next catering event. 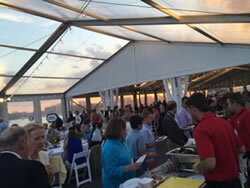 For an event right on the harbor, few places are better than Pier 4 at Courageous Sailing. Whether you’re hosting a cocktail party, a wedding reception, a fundraiser, or a business event, Pier 4’s stunning skyline views are perfect. As one of the more exclusive venues for catering events, Pier 4 hosts only 10 evening events and 10 day time events throughout the year. The Endicott Estate sits on 18 acres of beautifully manicured lawns and a wide variety of weeping willow, spruce, and elm trees just outside of Boston’s city limits. The venue is well equipped for catering events of all kinds, including sit down and cocktail wedding receptions, corporate dinners and events, and other special occasions. 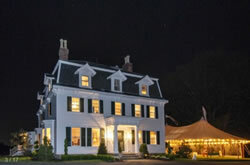 A splendor in both winter and summer, Endicott Estate is an incredibly popular catering event venue on the North Shore. The Essex Shipbuilding Museum is a must-see in Essex for both children and adults. 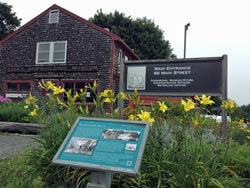 The story of the tiny New England village that built more double-masted wooden schooners used for fishing than any other place in the entire world is told here in a variety of exhibits. Field trips are planned throughout the year to enable students to engage in hands-on learning activities, and catering may be scheduled for your group event at the Essex Shipbuilding Museum. Gore Place is a historical New England event venue that brings to life the rich history of the Federal Era. With over 40 acres of vast landscaping, Gore Place is a piece of quiet countryside only 9 miles outside of Boston’s city limits. 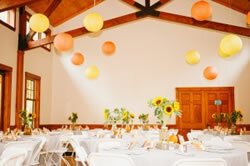 The venue is well equipped for catering of any kind, whether you’re hosting an informal clambake or a formal event like a cocktail wedding reception or even a sit down dinner. With a 3-season tent, and an historic carriage house with AC and A/V equipment, big or small, Gore Place can accommodate your catering event. 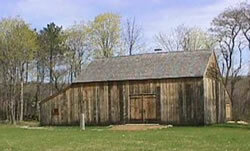 Gould Barn is a reconstructed historical barn from 1710 that is now used for a wide variety of events, including weddings, corporate events, and other special occasions. With original 300 year old white oak timbers and a rustic, countryside feel, Gould Barn is a great choice for your next event. Boasting both wheelchair accessible rooms, heating, insulation, and a kitchen, this venue can host both an elegant dinner reception or a laid back barbecue or clambake. The Hale Reservation has a wide variety of pavilions, buildings, and even campsites and fields to help you make your next event unique and memorable. Whether you’re celebrating a wedding or a birthday, or are hosting a company meeting or corporate event, the Hale Reservation has what you need to make it successful. Hale Reservation will work with your caterer to ensure that your event goes smoothly and your guests have a memorable time. If you’ve ever considered hosting an event at a castle, Hammond Castle in Gloucester is the perfect place. Nestled right up against the water’s edge, Hammond Castle is unique, historic, and breathtaking. While this venue is suited more to elegant weddings, virtually any event can be held in the Great Hall, Courtyard, Renaissance Dining Room, and more. Hammond Castle is the perfect place for having fine foods and sophisticated hors d’oeuvres catered for your special event. 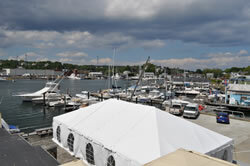 The Harbor Room is a tented event venue that sits directly on the waterfront in Gloucester Harbor. This venue is perfect for low key, casual clambakes, corporate events, and even weddings, showers, and special birthdays. With a large deck and both outdoor and indoor accommodations, The Harbor Room can accommodate up to 125 guests, making it a great choice for a small to medium catered event. The House of the Seven Gables in Salem, Massachusetts is a uniquely versatile event venue with a wide variety of rental space options. Choose the modern Plumsock & Holyhoke Rooms for smaller events between 75-100 guests, depending on whether you have a sit down dinner or cocktails catered. For larger events, such as weddings or corporate meetings, the Seaside Lawn accommodates between 200-300 guests. For ultra-intimate gatherings, the Hooper Hathaway House can accommodate between 30-50 guests for sit down dinners or cocktails. Few venues have the same Victorian charm and style as the Pierce House. 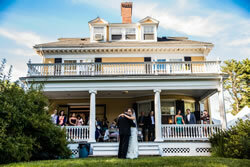 With three stories of Colonial Revival style, a large wraparound porch perfect for cocktails, and gorgeous gardens and expansive lawns, the Pierce House is perfect for weddings and special events of all kinds. 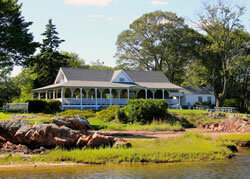 Host a summer clambake in a tented pavilion, or book your nuptials at this one of a kind venue. 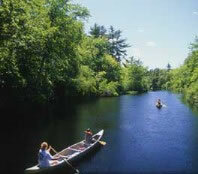 If you have a large event that you need private space for, look no further than the Thoreau Outdoor Center. Whether you’re hosting a birthday party, a corporate event, or another special occasion, the Thoreau Outdoor Center is one of the few Massachusetts event venues that offers complete privacy for exceptionally large groups – up to 2,000 attendees. With two swimming pools, wooded walking trails, basketball and volleyball courts, and a large tented seating area, there’s no place better for a large summer event with great catered food and lots to do. 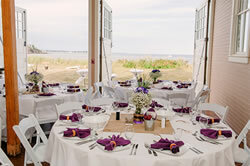 Mile Marker One at Cape Ann’s Marina Resort in Gloucester is a stunning event venue for all types of events. From corporate gatherings to gorgeous weddings and receptions, Cape Ann’s is perfect for both casual and elegant affairs. A barbecue or clambake can be held on the Skywalk, a private open balcony that views the Annisquam River. 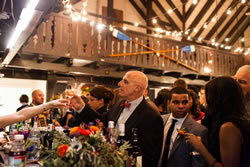 For an indoor venue, choose the Compass Room with expansive windows that overlook the docks, or for a more traditional event such as a wedding, choose the Waterfront Pavilion that seats up to 220 people for a catered dinner or up to 500 for a cocktail style event. 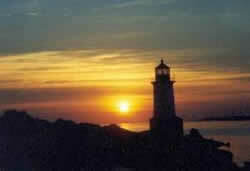 The Nahant Life-Saving Station dates all the way back to 1898 and is rich in North Shore history. Restored in 2010, this event venue boasts a beach front location with stunning views that is perfect for both traditional and casual affairs. Book a special catered dinner or wedding reception, or host a casual barbecue or cocktail hour for a memorable event. The historic 19th century estate at Pierce Farm at Witch Hill has the perfect mixture of old world charm and modern style for your special event. 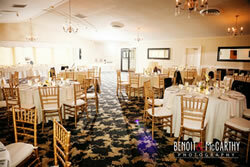 Surround your wedding with Victorian-era romance, or book your corporate event in one of the spacious meeting rooms. Use the estate house for your cocktail party, and then enjoy the rustic charm of the newly renovated barn with post-and-beam construction and attached deck. Pierce Farm at Witch Hill boasts facilities that can accommodate a wide variety of functions, from catered sit-down dinners to cocktail style events. The Robert Treat Paine Estate at Stonehurst is a unique event venue in Waltham that boasts stunning landscaping in a serene, country like setting. The venue can accommodate up to 150 people and there’s plenty of parking for everyone. The Robert Treat Paine Estate is a great choice for both casual and elegant weddings, corporate meetings, and catered events of all kinds. 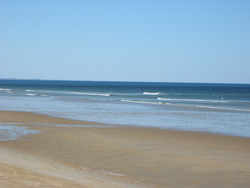 Salisbury Beach is a serene beach that stretches from the mouth of the Merrimack River to the New Hampshire/Massachusetts border. Perfect for both family outings and scheduled events, Salisbury Beach offers the natural beauty of the ocean as a backdrop for your catered event. Stage Fort Park is a waterfront Gloucester event venue that is perfect for scenic weddings, corporate outings, and other special occasions. Groups over 25 are required to make a reservation, and the facility has accommodations for catering, whether you plan to serve casual fare, cocktails, or an elegant dinner. 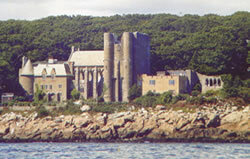 The Shalin Liu Performance Center is a music hall located in Rockport that also doubles as a unique event venue for weddings, parties, receptions, and corporate events. As one of WeddingWire’s top wedding venues in 2016, the Shalin Liu Performance Center is an excellent space for your special event. Boasting breathtaking ocean views and a third floor reception hall perfect for dancing and a catered dinner, your event here will absolutely memorable. 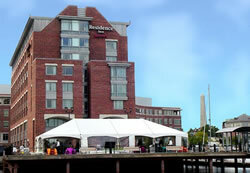 A hotel is always an excellent choice for a wedding or corporate event venue, and the Residence Inn Boston Harbor on Tudor Wharf is the perfect blend of modern hotel convenience and maritime charm. It’s one of Boston’s only outdoor locations for private events that overlooks both the harbor and the Boston skyline, and is excellent for weddings where out-of-town guests will need to book hotel rooms. Tucks Point in Manchester is a stunning location for any catered event, including weddings, picnics, and family or corporate gatherings. With a gorgeous beach, a gazebo, a covered and open picnic area, and swings, Tucks Point is a great place to have a harbor-style catered event where there’s fun for everyone. 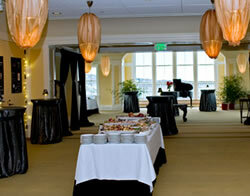 Winter Island in Salem, Massachusetts is a visually stunning backdrop for all kinds of events, both casual and formal. The generous function hall offers year round rentals, perfect for wedding receptions, birthday parties and anniversaries, or corporate functions. Host a laid back clambake or barbecue, or a catered sit down dinner or cocktail hour – either way, Winter Island will meet your needs. We couldn’t help but include our own Woodman’s of Essex on our list. Boasting a variety of function spaces including the Essex Room for wedding receptions and other functions, the Lobster Trap Pub for more casual events, the Salt Marsh Tent for outdoor events, and the Top Deck with screened windows overlooking the beautiful Essex River salt marsh, you’re sure to find the perfect location for Woodman’s catering right here on our property!